A short piece I wrote in early May just came out in East Asia Forum Quarterly, published by the Australian National University. Parts of it already feel outdated, but I’m glad I highlighted the Christian Liberal Party (CLP), military conscription system, HIV/AIDS, and Islamophobia — all still very current issues. Homophobia, I made sure to point out, is both a public health and a public safety issue. Please think of this as a primer on my ongoing and upcoming work on queer (geo)politics. 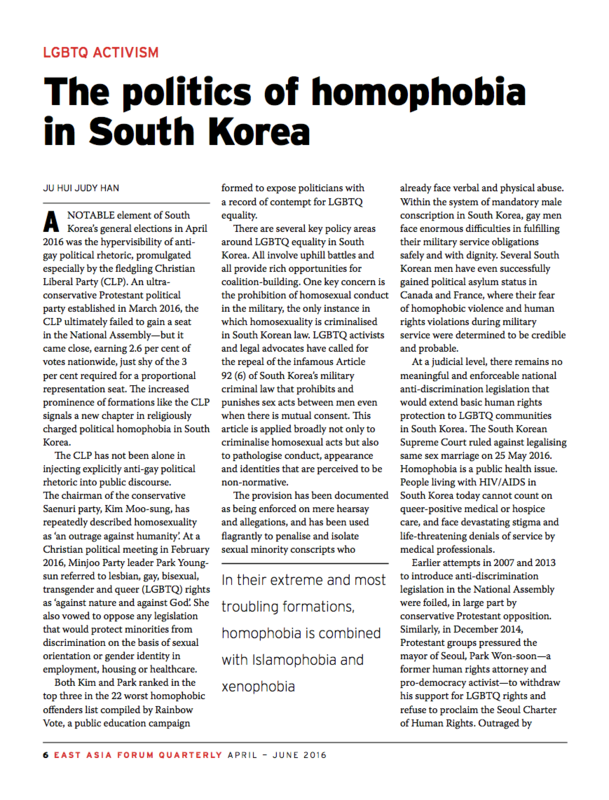 Conservative Protestant forces have been particularly unkind to minorities—sexual minorities, immigrants and temporary migrants who constitute religious and ethnic minorities in south Korea, and trade unionists, dissidents and social justice activists who compose formidable political minorities. Conservative Protestants and homophobic political leaders have even linked LGBTQ equality with terrorism and radical Islam, as can be seen in the recent CLP slogans of ‘No to homosexuality, no to Islam, no to anti-Christianity’, all in the name of national security. some have gone as far as to call for a stop to immigration from muslim-majority countries such as Pakistan and Bangladesh. In their extreme and most troubling formations, homophobia is combined with Islamophobia and xenophobia to bring hatred and bigotry to new heights. Read the HTML version (updated July 4, 2016), download the entire issue as PDF, or download my piece from Academia.edu.